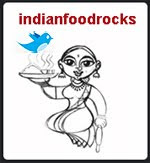 Indian Food Rocks is a personal journey through life spiced by Indian food and anecdotes. I am fully aware that it isn't very profound and that it reeks of being hastily put together to meet some silly deadline. It doesn't go nearly as far as back as 2003 when I first started this blog, but I remember that it was possibly in the year 2004 that I penned this. The earliest proof on the interwebs is dated September 2006, long before this food blogger started on her own journey (sic). What does it say about you when you have to use other people's taglines to arrive at your own? Maybe it's the season, but I am seriously creeped out. The excitement for Hallowe'en is building up as is the joy and sharing that comes with Diwali, the festival of lights. A couple of years ago, right around Diwali time, Nupur sent me her copy of Suvir Saran's American Masala: 125 New Classics from My Home Kitchen because she felt that I would be able to make the most of the meat and poultry recipes. This is just one of the many kind and thoughtful things that Nupur does! And, it made my Diwali even more special that year. There are very few people who can do fusion well and Suvir Saran is a chef who does just that and so much more. In American Masala, he has been able to add the warmth of Indian spices to dishes that are familiar to a western palate. He demystifies and simplifies to create flavors redolent of a world cuisine, rather than a specific ethnic cuisine. The book exudes Suvir's personality, whatever little I have been fortunate to experience. In the brief blurbs that accompany each recipe, he speaks tenderly of his childhood years and of those who influenced his food choices. I particularly love his spicy roasted cauliflower, which I have made several times over for a discerning group of Indian friends. Today, though, I thought I would feature one of our other favorites from his cookbook, lamb seekh kababs. The first time I laid my eyes on that recipe, I had to read it over and over as there was no ginger or garlic to be found in the list of ingredients. No oil either! I was intrigued. I also loved what I thought was a Persian touch: the addition of dried fruits, either apricots or figs. sheer luck that my friend Swati had given me dried figs! I have made these kababs with ground turkey and with local ground lamb, the latter wins hands down. Since I do not have a gas grill and I didn't have the enthusiasm to fire up some coals, I cooked these on high in my broiler. These lamb kababs are succulent and very easy to make. Just perfect. You have to try them! Soak dried figs in some warm water for about 10 minutes. Chop fine. In a large bowl, combine all ingredients gently. Divide into 8 portions and form each into a short thick cylinder. Thread each onto a skewer and squeeze and pat to lengthen them into long kababs. Broil until browned, about 4-5 minutes each side. Or grill them, turning over once, till done. Sprinkle with chaat masala and serve with some lemon wedges. Suvir's recipe was for 2.5lbs of ground lamb. I halved all the other ingredients for 1lb of lamb and increased the amount of chilli powder. Suvir divides 2.5 lbs into 8 equal portions. Neither I nor my skewers can handle quarter pound per skewer so I decided to halve that amount and keep it at approximately half of a quarter pound per skewer. That way, I got to eat 2 whole kabas and that made me really happy! You could use dried apricots instead of dried figs. I am not sure how many dried apricots you would need but aim for 1/4 cup when chopped, for 1 lb of lamb. I didn't miss ginger or garlic. That there was no oil was an added bonus! Kebabs, kababs, kebobs, kabobs. They are all the same thing! This makes for great burgers, too. Thank you for all the wonderful birthday wishes earlier this month! I made it to the summit of Flattop Mountain and had the best birthday yet! That's quite a number of WTF moments if you will excuse my language! Really, a billion for that? Wow---you'd think he'd have used some of the money to hire a good architect! It looks like a hotel from the inside! yuck! LOL the apples &tomatos--- I'm waiting for the day when Indian mangoes will be available in the US...to be fair even the monkeys in India wouldn't touch the ones we get at grocery stores here!! Social responsibility is for the middle class when did the rich care? Now they are out in the open. Did we not hear stories of Nehru's suits being sent to Paris for a wash? When the rest of India was doing swadeshi. Infact I see a rising no.of well traveled Indians especially here in the south opting for Indian goods and produce, something I haven't seen much in Mumbai and parts of the north. Vir Sanghavi sounds inconsistent in that post coz he is the same guy who hosted "Custom made for Vir Sanghavi" where he gets his shoes, scent, sherwani and even travel bag handmade in India and reiterates that the craftsmanship is world class here. One just has to find the right people. I read the Vir Sanghavi article too. Very disturbing. My first thought was : what am I going to do in India? That said, the kababs do look scary too :D but am sure they taste good :P looking at the clean plate. I love that picture and the pic with the dried figs. Neat. Hang in there with everything else happening, its bound to get better. Well, let's look at it like this...600 people find employment! It's like a medium sized factory! It is his way of making it all trickle down... :) What can I say - I am ever the optimist! Sorry to hear more on the blogger and her 'internalising' ways...let's not look - who knows what all is waiting to be 'found out'! On a tastier not, these kababs look easy and I will surely (honest!) try these out very soon - the next party! How many times do we hear "money does not buy you taste or class for that matter"? Fine example of that Mr. Ambani is. Creepy was the person, lacking more than just imagination in 'borrowing' your tag-line. Truly creepy is this Vir Sanghvi creature. What utter tosh is he spouting about not getting quality tomatoes in India? They maybe different tomatoes, but certainly not inferior. Will Monsanto be his saviour? Hate to think that. Enjoy the rest of autumn! Nupur, tell me about it! Thanks again for Suvir's cookbook! GB, yup! GBP 630mil. You do get the Alphonso in Indian grocery stores during mango season in India. They are very expensive and I have been told that they aren't all that great tasting either. I get my fix from the Ataulfo mango. I have heard that the Champagne mango is also flavorful. Anjali, I guess I am fortunate that the truly rich people I know lead relatively simple lives, committed to social and environmental change. Of course, I don't know anyone quite in the same wealth bracket as the Ambanis! Personally, I think Indian goods are of superior quality to the crap from China that we get here. I don't know much about Vir Sanghavi except what I found on his site and what is written about him. Nandini, what seems to come through is that to be a true foodie, you have to be somewhat of a snob. The British left a long time ago but apparently some people still have a hangover. Supermarket tomatoes? Really?! These kababs are excellent! In a couple of the pics, they even looked like doog poop. On the other fronts, one can only hope that people develop some sense of ethics! Anita, true that there are 600 new jobs. I hope that is not the only good thing about this monstrosity. 'Internalising?' What a great euphemism! Yes, better not to look! Shalan, you bet! At the same time, you won't believe how many people think shiny and golden is taste. I do wonder what vine-ripened tomatoes he is smuggling in his carry-on. As you said, they can be GMO and vine-ripened! As for the blogger, the less said the better! They are my second favorite apple, right after fuji. I don't know why they get so maligned here in USA. Yum! I love lamb and they look delicious. Everything I have made from your blog rocks. I am making this. well I couldnt figure out who has been so insecure as to copy a tag line - I mean isn't that the one thing which probably speaks the most about the writer - so wouldnt you want something which described yourself than someone else? I am not very creative myself, so I picked a quote by someone else, but atleast it fit MY thoughts perfectly! Lovely kababs - perfect for the weather here. Where in the city of Denver can one buy ground lamb? I guess I have to raise my own. I am just starting on my life's "Indian Food Journey." I have not had much exposure since I live in the mountains and Indian restaurants are few and far between. But...what I have eaten, I have loved! I watch an Indian food cooking show on "The Food Channel" for inspiration and have made a couple of dishes from that show. I agree, it's insane to import food from the US, especially red "Delicious" apples. They certainly are not delicious! Wow the kababs look so good. Lovely pics. yikes that skeleton thing really creeped me out! on a lighter note, the kebabs look really good! i've always wanted to buy ground lamb but never had a use for it. Nabeela, a red delicious that you buy could be upto a year old - from the time it was picked off the tree. They are picked and ripened and stored in refrigerated warehouses. A lot of them are mealy and not delicious at all. Read this now 5-year-old article for the scoop on Red Delicious. Gini, I hope you liked them! Sra, I did not realize that the thing literally towers over Bombay. I hope there is no-one richer than him who wants to out-do him. Miri, interesting, no? That someone would actually do that?! That she edited it was proof enough where she got it from in the first place! So disappointing. Caterina, I bought ground Colorado lamb at Whole Foods in Superior. It was tucked away in a small corner in the meat section. I'm so glad you are enjoying Indian food! Vandana, thank you! Enjoy your weekend! LimeCake, I hope that means you now have a use for it! The kababs are so very good! Manisha - wish you and your family a very Happy Diwali! Happy Diwali Manisha to all of you. Wishing you warmth & happiness now and always. Miri, Soma, thanks! Hope you had a good one, too! Thanks for the lil revelations! There was a time when apples in India were either from Kashmir or Himachal... & the nostalgic taste & flavor still lingers on...Unfortunate that we choose to deliberately toss those away in favor of apples that look like they were grown @ Madame Tussauds! Whats with Vir Sanghvi? Did he have a stroke that affected the sensory part of his facial nerve? Desi tomatoes are flavorless indeed..His idea of 'good' tomatoes are probably those huge generic beefsteak ones with the mealy texture!, & he is a food commentator.. Nuff said! Love your blog and read it regularly. Have been really touched and more than a tad tearful with some of the posts and rolling with laughter with others. Commenting on Vir Sanghvi's tomato preferences - well they don't matter anymore since post the Radia-tapes the wily creep's credibility has been completely destroyed. Who cares which tomato he endorses...he can soak his pen into one of those tomatoes (flavorless or not!) and rid us of his dishonest opinions! Your lamb kebabs look fabulous!